Let's get Basic Ladies! If your anything like me, then basics aren't always your favorite thing to buy. Usually something much more fun like the perfect party dress can sway me out of my focus on new white pants or a new white tee like a fish, I gravitate towards sparkly and bright objects. Let me tell you ladies - start buying those basics now or you will regret it. I realized a few years ago when I started this major wardrobe overhaul that I had literally no nice basics, as a girl who lives and breathes fashion and shopping, all I had to show for it were a ton of party dresses that weren't really appropriate for my life after college and lots of trendy pieces from Forever 21. A few years into my twenties and I basically had to start from ground zero on my wardrobe. I started a major overhaul, cleaned out my closet, and made a list of all my wardrobe essentials that I was missing and the areas that my closet was really lacking, I mean I didn't even have white jeans. I also added a wish-list of those items that weren't exactly considered staples but would definitely feel like staples in my closet and my life. Now if I am shopping, it is thought out and I am always buying from my list. 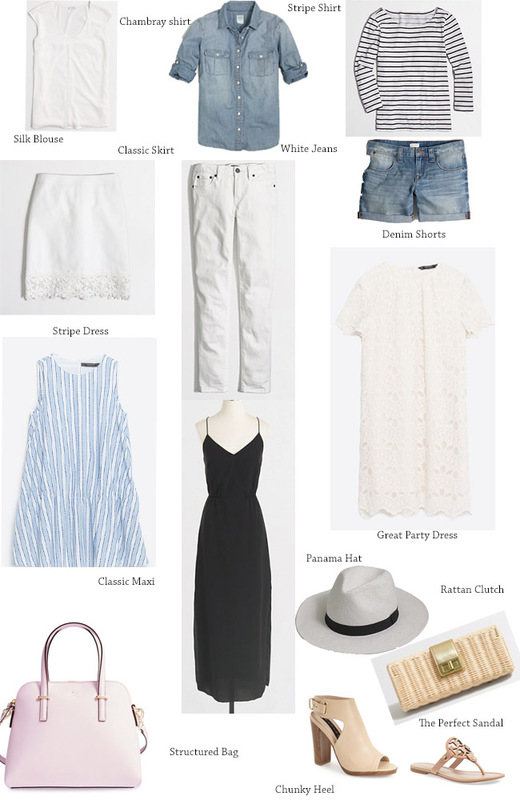 My round-up today are the items that I consider wardrobe staples to carry you from Spring into Summer. It may not look like the most exciting collage but you will always be able to make a super chic outfit with these pieces. What are your wardrobe essentials? Let me know if you want to see more posts where I talk about wardrobe essentials and organizing your closet. Now on to the giveaway announcement - thank you to everyone who participated! GIVEAWAY WINNER - The winner of the BeautyCounter Giveaway is Kayla Bowe! Congrats Kayla - I will be e-mailing you today so I can send you the fabulous eye cream!